More than 200 leaders from 71 American Indian nations in Mexico, the United States and Canada came together to the natal town of Lord Pakal Ahau in Palenque on March 2008 with a 2012 message. Here’s the AP article. Mar 11, 1:53 AM (ET) By MARK STEVENSON – PALENQUE, Mexico (AP) – North American Indians assembled in the shadow of ancient Mayan pyramids Monday discussed how their tradition wisdom could help save the planet, and were told that even indigenous cultures have struggled with environmental abuse. More than 200 leaders from 71 American Indian nations in Mexico, the United States and Canada came together in this Mexican jungle to find indigenous solutions to pollution and ecological problems threatening the planet. The conference began with a pre-dawn ceremony that included fire, copal incense, chants in Lacandon Maya and blasts from a conch shell. Speakers reminded attendees that even Indian cultures have battled with environmental abuse and pointed to theories that deforestation contributed to the collapse of the Maya who built the temples at Palenque. “In this way, the indigenous communities can become the natural guides to restoring balance and harmony in the world,” he said. The lessons they have to teach are simple – based on reviving Indian notions about ownership, use, compensation and respect. NOTES FROM THE EDITOR: K’in Garcia, Maya Lacandon priest, original from Naha, initiated the ceremony playing the caracol, an indigenous musical instrument, whose sound was followed by a strong response from the Zahuahuetos monkeys living in the dense rainforest. K’in accompanied by four indigenous priests placed an altar in the central patio of the archaeological ruins at sunrise (5:41 am local time – 11:41 GMT) with five containers, fired with copal in honor to five Maya deities, and in the center of the flames, they placed a crystal skull as the main god. The priest invoked to Hachakyum, the god of gods, “the one who created the sky and jungles”. On March 13, at the conclusion of the meeting, a document entitled “The Palenque Manifest” will be prepared, which contains the Declaration of Principles of Tribes of North America, including the conclusions and contributions of the gathering from several indigenous point of views and their beliefs to continue a sustainable development of the planet.
" A few shall see what none yet understands; for man shall not know the coming until its hour and belief shall be not until the work is done." (Lord Pakal Ahau. 1988.). From the Maya Director of the Mexican Sacred House of Pakal and the Ancient Order of Chilam Balam and its Nine Degrees comes an extraordinary story of love and devotion in a land of miracles, of magic in a world of fear and an ancient prophecy that will change your life forever. We seek a new beginning. In Maya, Yan haxtik tuum'ben chuunuj. 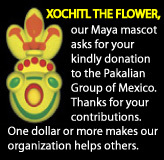 Este blog y trabajo de Pakal Ahau dedicado a todos nuestros hermanos latinos de raza y a nuestra Mesoamerica, el orgullo de nuestra sangre de dioses. He came out from the deep in 1952 Visit **Lord Pakal's Trilogy Web Site. Click here to make your safe PayPal donation. Thanks. Our New Store with Original Mayan Designs and Great Selection of Products. Click To Visit. Who is Lord Pakal Ahau of Palenque? Why Do We Sell Mayan Tees? 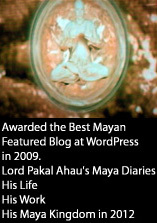 Enter your email address to subscribe to this Mayan blog and receive notifications of new posts by email.